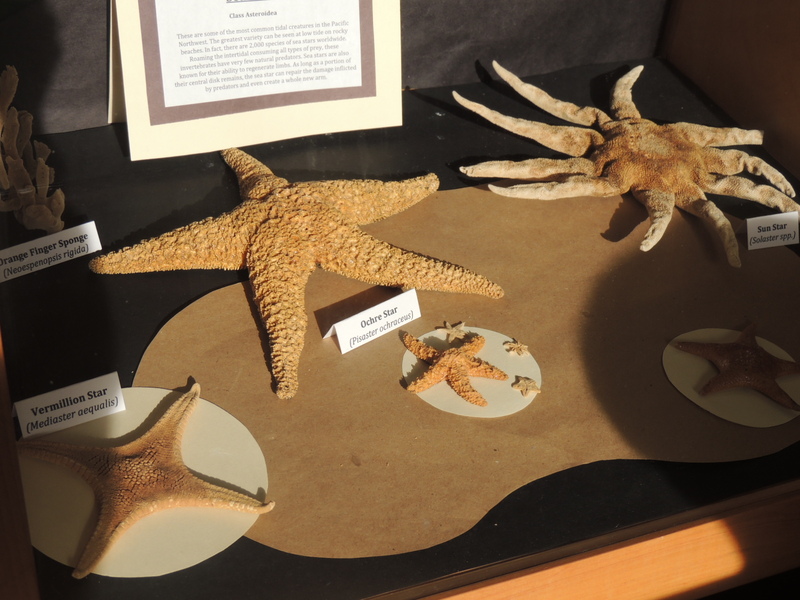 Our featured treasure for October is a small ochre sea star, found in the tidal creatures display at the Natural History Centre. Also known as the purple starfish, sea stars have a special place in the heart of Hornby Islanders. They were even the theme of this year’s fall fair. Although their population has declined over the years, increasing sightings of sea stars recently suggest it may be climbing once again. Sea stars are some of the most common tidal creatures in the Pacific Northwest. The greatest variety can be seen at low tide on rocky beaches. In fact, there are 2,000 species of sea stars worldwide. Roaming the intertidal consuming all types of prey, these invertebrates have very few natural predators. Sea stars are also known for their ability to regenerate limbs. As long as the portion of their central disk remains, the sea star can repair the damage inflicted by predators and even create a whole new arm. Removing sea stars from beaches contributes to their decline. You can help the population by leaving sea stars on the beach and asking others to do the same. Sea stars in the tidal creature display at the Natural History Centre.